The State Library of New South Wales in Sydney, Australia, recently hosted an exhibition titled Pulp Confidential: Quick & Dirty Publishing from the 40s and 50s. This exhibition, which featured many rare Australian “pulp-fiction” novels, comic books and other periodicals from the 1940s and 50s, was assembled from the archives of the Frank Johnson Publishing Company, which were acquired by the State Library in 1965. 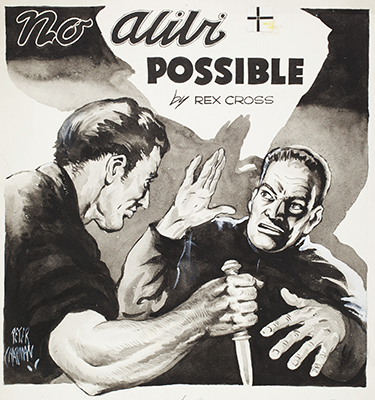 This exhibition will be of particular interest to Phantom “phans”, because it featured many comic books and “pulp-fiction” novels and magazines illustrated by the Australian comic-book artist, Peter Chapman, who later became a staff artist and editor for Frew Publications (Sydney), which has continuously published the Australian edition of The Phantom comic book since 1948. Interestingly, Peter Chapman was sometimes called upon to redraw sections of The Phantom comic book during the conservative 1950s era, especially if some of the original (American) artwork depicted scenes deemed too violent to safely make it past the gaze of Australian censors. You can see an example of Peter’s “censored” artwork in The Phantom No.1720 (Replica Special No.4), which reproduces Frew’s original edition No.188 (published in 1961), and has a censored sequence from Part Two of “The Seahorse”, redrawn by Peter Chapman (Take a close look at the panels from this story where The Phantom has been lowered underwater by the evil Baron Danton, and you’ll see what I mean – that’s not the work of the original artist, Ray Moore!) For more details about Peter’s life and work in Australian comics and beyond, you can read my 2007 ChronicleChamber.com interview with Peter Chapman here. 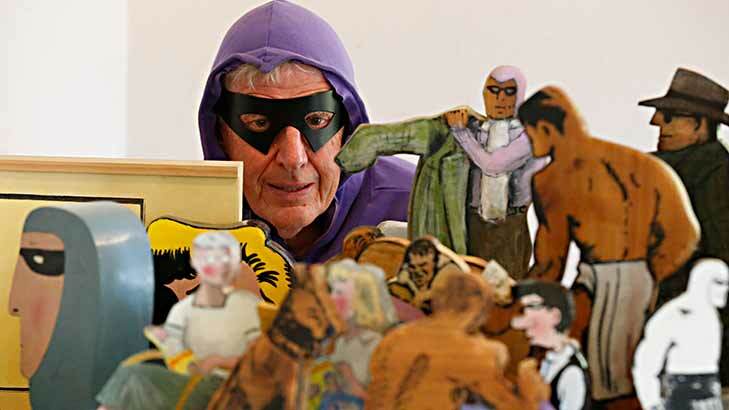 Although the Pulp Confidential exhibition closed on 10 May 2015, you can still visit the State Library of New South Wales’ exhibition website, which features a video documentary narrated by the exhibition curator, Associate Professor Peter Doyle (Macquarie University, NSW), wherein he interviews Peter Chapman at his home in rural New South Wales (Image courtesy of the State Library of New South Wales).